It has been quite an interesting week around here and all in all I have adapted to my temporary handicap, or so I would like to think. I actually wrote a menu list which is scaled back from my usual sometimes, tedious prep and cooking. Lowe’s foods to go has become my a new planning tool for my menu planning and tonight it did not fail me, I checked for the ingredients before hand and Mike picked it all up for me. 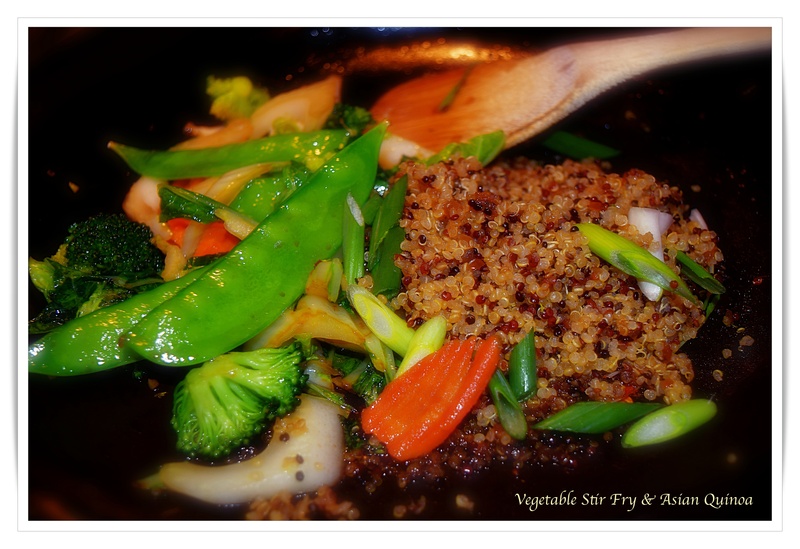 While simple, a bag of prepped stir-fry vegetables and a couple other small items and I was ready to toss together a simple dinner of quinoa and vegetables for myself…Michael would request meat or poultry tossed into the mix. It was quite the experience and as for the rest of the upcoming menu it is homestyle oriented with something smothered and something chicken fried with appropriate sides and I know Michael would enjoy that for a change. We shall see what comes out of the pan tomorrow. 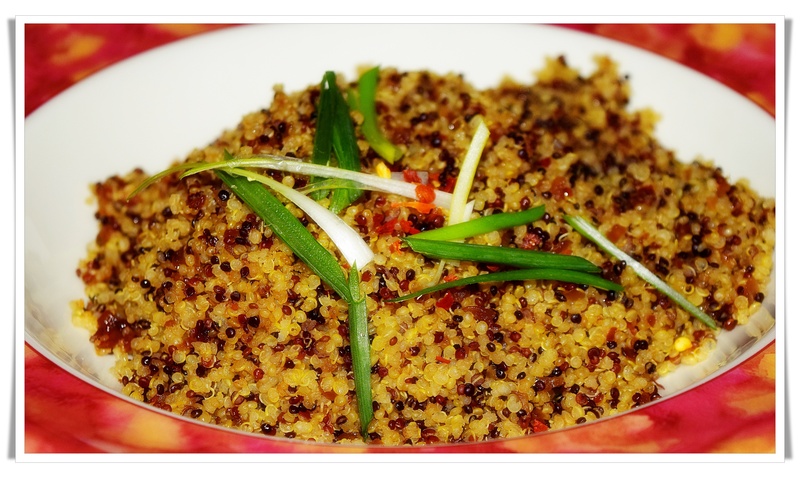 I love quinoa and an interesting recipe from Chocolate & Zucchini popped into my mail box last week and while I made a few small adjustments, the recipe is a good simple recipe for anyone that enjoys a good bowl of Asian-style quinoa. Link below to C&Z recipe…I adjusted the amount of sesame oil, reduced it a bit, used equal parts shallots and onion, and used honey instead of the brown sugar. 1. Cook the quinoa according to packaged directions ( I used 1/2 water and 1/2 chicken or vegetable broth). Remove from the heat, cover, and let rest for at least 10 minutes or more. 2. Heat the sesame oil in a medium skillet over medium heat. Add the ginger and shallots and cook for 3 minutes, stirring frequently, until softened. Stir in the sake. When it has evaporated, add the soy sauce, sugar, ground chili, and 1/4 cup) water. Simmer for 2 minutes, until slightly thickened. Remove from the heat.